Are ready to step into the world of witchcraft? Maybe you have a couple of friends that are prepared to join you as you venture into the spooky world of the occult. This crafty tin sign is a great way to decorate your witchy home as you practise your black magic. Featuring the eerie symbols of the Ouija board, this amazing sign is the perfect accessory statement for the hocus pocus home. 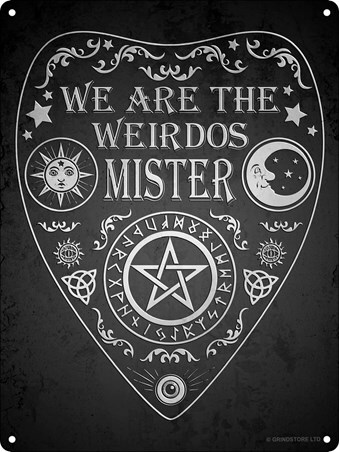 High quality, framed We Are The Weirdos Mister Ouija Mini Tin Sign, mini tin sign with a bespoke frame by our custom framing service.